TAKE NOTE Front ladder rack is removable for cleaning. TAKE NOTE The partition adjusts to hold your display. Pasta and beans are a popular style, but don’t overlook your collections. Corks, vintage cookie cutters, rolling pins, toys, linens, matchbooks, tin recipe boxes, crate labels...there are many collections that add interest and texture to a room’s design. 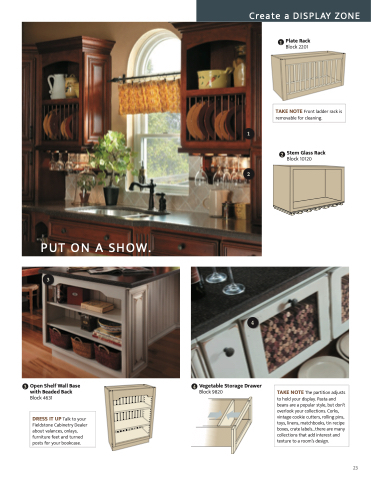 DRESS IT UP Talk to your Fieldstone Cabinetry Dealer about valances, onlays, furniture feet and turned posts for your bookcase.